After I checked the weather reports, yesterday, I decided to push South, today. But it howled again during the night and the seas were wild this morning. 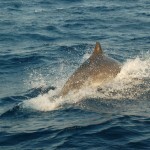 It slowed down again some but I need a full daylight day to get to my next protected anchorage, on Samos. I am getting cabin fever. But fortunately I have been putting my stop here to good use. I managed to translate a good portion of the “The Mastmakers Daughters” and in the process also got a better handle on the original Dutch version. I’ll keep at it for a couple more days. The winds are supposed to be even stronger tomorrow and then start tapering off by coming Tuesday. I have been checking the flights for an eventual round trip to Amsterdam if all works out for an inexpensive flight to Seattle and back. Stay tuned. The summer has come to an end, most of the tourists here are young families with children younger than school age and older folks. I do my internet here from a cafe on the malecon. My Vodafone USB connection is too weak to do my blog. I was unable to download my e-mail this morning through the Vodafone connection because someone sent me some silly joke, one of those that you have to forward to your entire address list under the threat of turning into a salt pillar by non conformance, it just could not make it through the weak connection, till I made it into town. So, if this is my last blog you saw, you’ll know why…. The wind is till howling through the rigging, particularly at night. It is not letting up. Tomorrow it is supposed to get up to as much Force 9 to the West of the island. I am hiding out with still 4 of the 5 French boats and one Dutch boat. I re-caulked my teak deck seams and still have a few other chores. 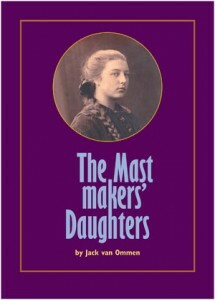 But I have been spending most of my time translating “the Mastmakers Daughters” from the Dutch. This is a good spot for it. It is free and well protected. I am still awaiting news from Germany for my marine insurance application. A new plan is forming. I might come home to the N.W. for Thanksgiving and Christmas. I will have more details in the next days. Taken in Istanbul: L.R. Carolynn & Patty Mitchell, Carol, Jane, Keith Benton and Jack. I still cannot believe how much Keith looks like my long time friend Sid Nesbit. What do you think? The wind came up strong during the night and I decided to wait for more moderate conditions. But it has not let up all day and apparently this is just another strong Meltempi wind. At least 25 knots. Fortunately from the North but the seas are rough because there is a North running current here. The Meltempi usually peters out by the beginning of September. The French have taken over in force in this little port, 5 of them now, one Dutch boat, et moi. A couple of the French boats will also haul out for the winter, just North of here. It sounds like a far better option than most of the places I have heard of in Turkey. I might be tempted to give it a try if I get bored of hanging around in a Turkish marina and see if I can get an affordable flight to the States, for part of the winter. I tanked 47 liters of diesel from a tanker truck along side in the port here. The French had ordered the delivery. I was surprised at my fuel usage. Now that I am bolder in running the engine at a higher RPM it also means higher fuel consumption. If I had more choices of anchorages within the short day light hours I could slow down but from here on they are mostly 50 mile plus passages. morning and work my way further South. application with the German ADAC. Keep my fingers crossed. Catholic Church under the Venetians/Genovese traders/occupiers. laundry done, Seventeen dollars, Ouch!.. over this harbor, three against one Dutch and one American boat…. And I thought would never end. Today it tried to rain a few times but the wind is from the S.W. and warm. I still sleep without a blanket. Tomorrow the wind is supposed to go back to the usual northerly. But I might stay another day here. I like to get my laundry done here. I am in good company at the marina, A Frenchman on the bow, from Sete, and another on the stern from Bretagne, then there is “Marvin” from Rotterdam and Jan Swerts on “Petti” from Antwerp left this morning. It would be a good walk to town but with the folding bike it is an easy 10 minutes. 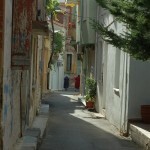 Khios or Chios is a very attractive old city. It has an old Turkish quarter. 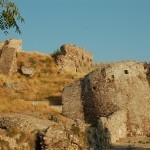 The sprawling remains of the fortifications from the time of Genovese traders and Turkish occupations. 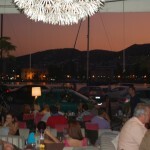 Close to the marina is a large Spar supermarket and a service station where one can fill the boat’s fuel cans. The Dutch couple on “Marvin” is hauling their boat out here. The price seems to be alot better than in Turkey and it is quite accessible with the ferry to the Turkish mainland to catch a flight from Izmir. 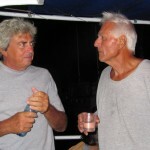 The Bretons are spending the winter in the marina in Mitilini, where I was persona non grata. I keep getting more details on the best places for me to spend the winter. 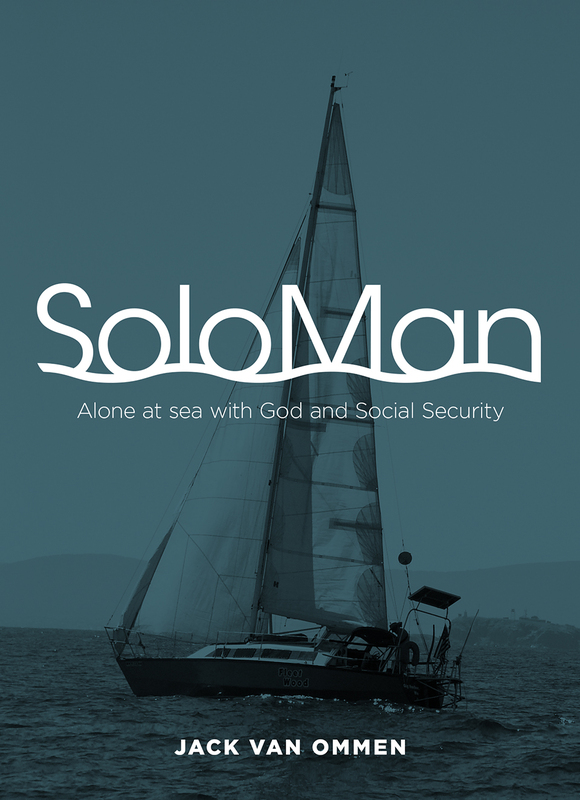 I have a new lead on insurance through the Trans Ocean cruising club in Germany. I am awaiting their reply. I had planned to anchor in Mandraki, see below picture, last night. 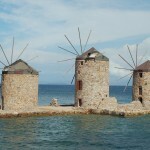 But when I took another look at the cruising guide that there is port administration there, so I headed for Chios Marina. Mandraki has a particular distinction, it is the home of many of the large merchant ship owners, including Costa Lemos who by far outstrips Onassis, Livanos and Niarchos in tonnage. 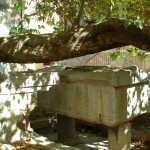 The picture of the crooked Sycamore over the tomb like structure is not entirely clear to me. Maybe someone can help. 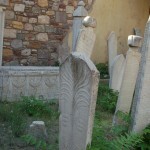 A tourist thought that this was the former Synagogue yard. 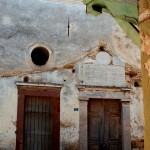 The building is now a Greek Orthodox Church, St. George. There is a water well that apparently fed water over this stone structure. But anyway I managed to get an education on the Romanite Jews, brought as slaves during Herod’s reign to Rome and then settled on this island and ther later Sephardic Jews who were chased out of Spain during the period of the Inquisition and found a welcome by the Byzantine Turks and later the Venetian and Genovese traders/colonists. The Turkish mainland is only 5 miles across the water from here and I am getting wire less reception on my Vodafone modem. But still need to use the internet cafes for the long file up/down loads. I am using one of the arrows out of the venial sin quiver. Snuck into the marina here which was built a few years back and then abandoned. There is no one to manage it. A couple rust buckets are parked in here but there is plenty of good moorage. It is two miles south of the town of Chios where the authorities keep an eye on the traffic but not in this marina. I rode the folding bike into town. Tomorrow I’ll add some pictures. It was dark by the time I had the boat cleared away. 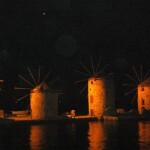 There are some interesting old wind mills on the water’s edge. The weather is changing and might stay here a couple of days. I started on the translation form Dutch to English of the book I am writing about our mother “The mastmakers Daughters”. And that will be a good excuse to wait for better weather here. I covered over 50 nautical miles today, motor sailed most of the way, very pleasant day on the water. Without that magic paddle. The Harbor Master roused up an insurance agent. I followed him to his office. But then ran into a wall because without a master’s navigation certificate no insurance. So, just think of all the insurance premiums I get to keep… But I have a hunch that this hurdle will be thrown up again beyond Greece before I am done with the Med. Was I just lucky to visit 45 countries without insurance and a captain’s license? 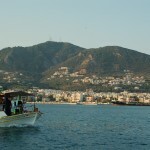 This will make it difficult to plan to have guests aboard beyond the Turkish ports. From here tp the next anchorage is over a 50 mile haul, so, I stay here till early in the morning and then clear out with the Greeks. The weather is changing. Rain is in the forecast and only weak winds from unpredicted directions. So probably a lot of motoring. I am starting to become a little more bolder with the RPMs and the stuffing box is not overheating any longer. The fixed prop delivers more power than the folding prop ever did. And, knock on wood, the Raymarine ST2000 autopilot is still working flawless. Like Eros, I still have a few arrows in my quiver as far as seeing more of Greece. Stay tuned. I fessed up to the harbor mistress. They are searching for an insurance agent and I’ll bechecking back with them. In the meantime I searched on line. Not a fat chance. Not for foreigners and in the USA I would need to be hauled out and a $ 500 plus survey done. I tried that already once in Green Cove Springs, Florida. So, if you happen to see a 30 foot brown hulled sail boat crossing your path on the World’s oceans you are seeing the Flying American Dutchman. 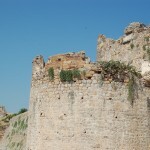 I walked up to the old fortress overlooking the town. That had to be hard nut to crack for the Turks, Saracens, etc. I stopped in at St. Theodorus Greek Orthodox church. And I happen to find there the only Asian I have seen in Greece so far. A young Filipino who was an assistant there. His folks had been raised Catholic in the Philippines. He answered some more of my questions I had about the two churches. I met the Dutch couple of “Wilde Zwaan” from Harlingen. Henk Jansen, who happens to be born in Ommen…, and Ankie Woudstra (?). They also sailed the Black Sea this summer and they had even less hassle and clearing expenses than “Stella Maris”. So, it sounds that there are ways to see this part of the Black Sea without the horror stories I had read on the web from other boaters. 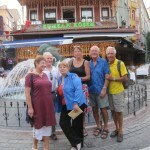 They sailed into the Med three years ago and keep their boat for the winter in Fethiye. You now know where the word Marble comes from, Hamburger and Caulking (Calafat, Romania) here is a new one: Lesbian comes from this island of Lesvos. 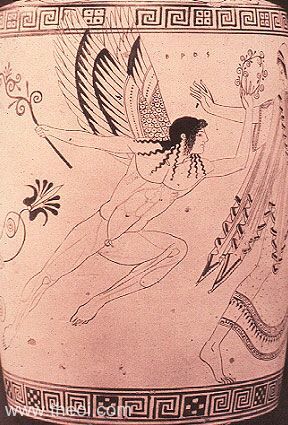 According to a mythical poetress from this island who wrote about her female lover. The below picture of Giovani and I was sent to me from “Stella Maris”. 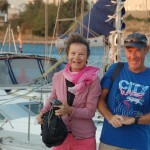 Inge took it of us in Sozopol at our get together on Christopher’s boat. You all know that I am a very modest person, to the point of shy, but I like this picture because it shows that the sailing life is keeping me fit. The overhaul job in May/June and the physical part of sailing is a healthy life style. So, just in case you thought I am drinking water. Wrong. Raki. Similar to Ouzo, Pernod (Anisette). Waning Moon over Mitilini, “Wilde Zwaan” to right of the large yacht. Sept 18. Nana Mouskouri’s Sunday. Well that keeps me out of trouble :”Never kiss her on a Sunday”. 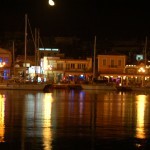 I arrived, last night, after dark in the harbor of Mitilini. No church picture today. It was nearly noon when I was done with the clearing in process. After plotting my possible destinations, the Greek ones were too far to reach before dark. 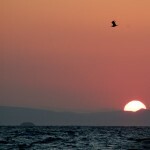 So, I set my destination on the Turkish main land at Ayvalik. It was a little further than a day light arrival but the port entrance was lighted. My first 15 or so miles down the coast were dead down wind in about 20 knots, since I did not want to constantly gibe the main sail, I ran under the 90 percent jib and the motor. The next 30 miles should have been a nice reach, but when I made my right turn between the Turkish shore and the Greek Island of Nisos Lesvos, the wind just was no where any more. Flat calm, but when I passed the N.E. corner of the Greek island the wind came up strong and there was a big swell and waves. The last 20 miles were going to be a miserable sail into the wind and waves. So, I went back to the Greek plan, I had made decent time till then and this wind would be a good sail to Mitilini on the S.E. 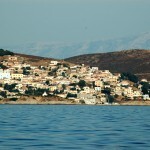 coast of Nisos Lesvos. 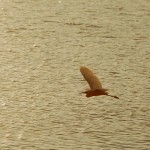 It was a hard reach and the wind strengthened to between 25 and 30 knots. I had to put two reefs in the main and was still hitting sevens. The wind vane had great difficulty keeping up with the waves and the tendency for the boat to round up into the wind and I hand steered this part. I had to use all my muscle power to bring her back on the trail after a wave hit the aft quarter. But it was a thrilling ride. anchored but an hour later the harbor police came to tell me to move and I tied to the dock at the customs section. I could not get through the gate till I cleared in this morning. The Turk Greek crossing has thrown up some dilemmas for me. Technically I should have cleared out from Turkey but then when re-entering I need to go through all the crap again and the expense of another transit log. But the same problems I’ll have on leaving Greece. Their 30 Euro transit log is only good for 6 months. So when I come back after my winter’s stay in Turkey I’ll need to shell out another 30 Euroes. And since I like to make a couple more stops in Greece before going into my Turkish hibernation I’ll be to committing a couple venial sins. But the one hurdle that I had not anticipated is insurance. 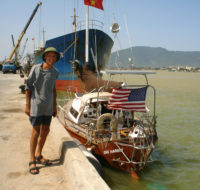 I am unable to obtain insurance in the United States for a wooden boat, other than for navigation in local US waters. And as a foreigner I cannot get insurance anywhere else. In Turkey they also asked for it but did not insist on seeing the evidence. Greece is the first of the 43 countries I have cleared in that requires it. To be fair I think it is a reasonable request. Who wants to have a visitor like me make a mess and unable to cover his damages? But what to do? I plan stay here till tomorrow morning and then I might plot another Greek destination. Possibly further down on the same Island. If the port captain let’s me out of here without insurance. What I have seen so far of my first Greek destinations meets my expectations of the picture we have. I had been to Athens on business trips a couple times 30 years ago. The blue Mediterranean, bright whitewashed and pastel color buildings. Men drinking their coffee in the sidewalk cafe’s. Listening to their language I find it sounds so much like Castilian Spanish. reasonably protected from the Northerlies. I covered 60 miles in less than 12 hours. It was a wild knuckle ride through the narrow strait that connects the Sea of Marmara with the Aegean. The wind blew a good 30 plus knots and the waves at times became too much to handle for the Monitor windvane. All I could manage was the 90 % jib and in the last part had to reef it down to 60%. The current runs as much as 3 knots and I was getting readings of 9 knots over the ground on the GPS. I had to hug the Eastern shore to stay out of the traffic lanes and at times there was just about enough room between shore and the traffic lane to squeeze a hearse through. So, for the first time, today, since July 2009 I have dropped down below the magic Latitude 40. 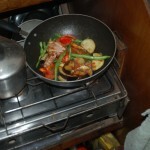 I am frying some chicken legs that I bought in Kelem (my friend Matthias Klemm located it for me) last night. With rice and a cucumber/tomato/onion salad. The next post might be from a Greek island.